BEFORE: eggshells, orange peels, wilted lettuce, potato peelings, leftover pasta, the ends of carrots, squishy grapes, teabags, coffee grounds, apple cores, rose prunings, rhubarb strings, kiwi fuzz, sandwich crusts, avocado skins, dried-out cheese, strawberry tops. AFTER: rich new soil for my garden, chock full 'o worms. 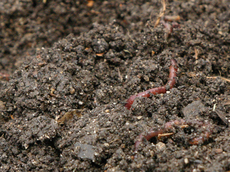 Why do worms come out during rainstorms? Why do they die in puddles? What is that band around the middle of worms? What happens when we dig worms up? Is air ok for them? Is sun safe for them? 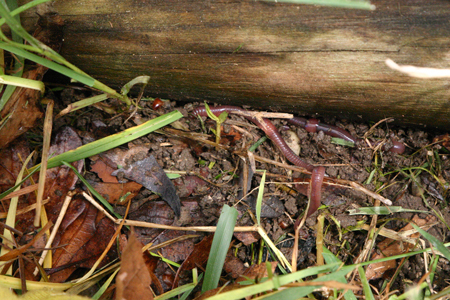 How do worms contribute to composting? Why are they good for gardens? What exactly is "the sound that's made by worms" referred to in the song by that title? We ♥ worms. Seriously, check these beauties out!